Long non-coding RNAs (lncRNAs) are known as RNAs that do not encode proteins and that are more than 200 nucleotides in size. Previously, it has been found that LncRNAs play crucial roles in normal cellular processes, including proliferation and apoptosis. A growing body of evidence suggests that lncRNAs may also play regulatory roles in the initiation, progression and metastasis of various malignancies, including breast cancer. SNHG6 is a lncRNA that has previously been found to contribute to the initiation and progression of hepatocellular and gastric carcinomas. 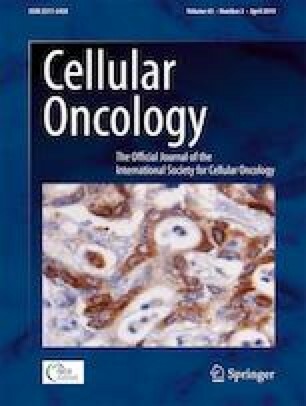 In this study, the clinical significance of SNHG6 expression in breast cancer was investigated. SNHG6 expression in primary breast cancer tissues was assessed using RT-qPCR. The functional role of SNHG6 was investigated using RNAi-mediated silencing and exogenous overexpression in breast cancer-derived cells. MTT, colony formation, cell cycle, apoptosis and senescence assays were used to determine the impact of SNHG6 expression on breast cancer-derived cells. The effect of SNHG6 on the migration and epithelial-to-mesenchymal transition (EMT) of breast cancer-derived cells was determined using scratch wound healing and immunofluorescence assays, respectively. We found that the expression of SNHG6 was significantly upregulated in primary high-grade and progesterone receptor (PR)-positive breast tumours. Additional siRNA-based experiments revealed that SNHG6 silencing led to G1 cell cycle arrest in SK-BR-3 and MDA-MB-231 breast cancer-derived cells. Moreover, we found that SNHG6 silencing led to suppressed breast cancer cell proliferation by inducing apoptosis and senescence. Our data also indicate that SNHG6 may contribute to the migration and EMT of breast cancer cells. Our results indicate that lncRNA SNHG6 is involved in breast cancer development and may be considered as a potential biomarker for the diagnosis, prognosis and treatment of breast cancer. This research was supported by the Iran National Science Foundation (INSF) grant number 93030186. All biological materials were provided by the IRAN NATIONAL TUMOR BANK, which is funded by the Cancer Institute of Tehran University of Medical Sciences for Cancer Research.